Pink may be Jessica’s favourite colour, but this girl is no powder puff. She’s a teen who holds strong opinions, and considers herself a person who takes no guff from anyone. This aspect of Jessica is reinforced by her intense involvement with the school wrestling team. Jessica doesn’t merely enjoy competitive wrestling—she loves it! Currently in Grade 9, she joined the team at the beginning of Grade 8. “At first I wasn’t serious. I thought it would be cool, wearing tight little singlets, but that soon changed.” Now Jessica competes in grueling tournaments where contestants fight three consecutive two-minute rounds with 20-second breaks for water and strategic advice. The singlets must get sweaty. There are fifteen or so on the school team, and to my surprise, there are very few guys. The explanation, according to Jessica, is that wrestling is considered “gay” in the lingo. “Guys just don’t like the image of tight spandex,” she adds. Jessica, the competitive wrestler is no slouch academically. Achieving in school is important to her. She says she’s always gotten good grades, and wants to graduate with good grades, and knows she’ll be doing post-secondary studies. “I’m drawn to law,” she says, “because I love arguing with people. My mom agrees that I’m argumentative. In fact, everyone says so.” Law is not Jessica’s only focus. She likes solving problems, so counseling, even psychiatry, is high on the list of possible vocations. And then there are computers. Currently she’s becoming competent with html, the language of computers. Feeling good at school and about school contributes in large measure to a teenager’s feelings of well-being or unhappiness. Jessica was frank in her discussion about chronic problems experienced at school, and feels the school administration and teachers should be doing things differently in order to promote a good and fair social and academic environment. What are Jessica’s views on growing up in a small town, and in Tofino in particular? “What I like best is being able to trust people. So many people know you and are looking out for you, in a way. I think small places are so much better than cities. There’s too many cliques based on categories in big schools—the jocks, the nerds, the Goths, the this, the that. There are so few of us here, most of us manage to be more or less friendly with everyone. Personally, I try to get along with everyone.” It was encouraging to learn that some of the teen problems we read and hear about are negligible among our secondary students. For example, according to Jessica, bullying by either gender is “mild”, and there are few fights. Jessica confirms that girls are very competitive socially and demand more attention than guys. I asked her opinion about the tendency to use zero tolerance policies as a way of dealing with unacceptable behaviours. Jessica does not agree with it, suggesting that first, students should first be warned, then if the problem continues, the parents should be advised, and then, if necessary, the student should be suspended for a few days. “Depending on the circumstances, the main thing is to avoid action which makes the student even angrier, which only increases their anti-social behaviour,” she says. So, enough about school. What’s Jessica’s bedroom look like? When I suggested a visit to her inner sanctum, she said, “No problem”. I wondered if the floor would be wall-to-wall clothing and clutter, but no, Jessica’s room is organized and pleasing. What struck me immediately were the uniquely painted walls the colour of ballpoint ink blue spattered with bight yellow. Jessica did the painting herself. There are no hunks hanging on the wall, but there are posters of surfing and snowboarding. In one corner are an ample desk and a computer game station. Photographs of friends keep Jessica company. Books keep Jessica good company too. She just finished Oryx and Crake, by Margaret Atwood. Authors Stephen King and Dean Koonz are favourites, as she likes horror and mystery. Jessica says she is somewhat of an insomniac who reads when she can’t sleep. Jessica had some suggestions about what would make Tofino a better place for youth starting with #1—a big mall with a theatre right in it. Even though I expressed horror, she wouldn’t take it back. #2—a high school right in Tofino. #3-- unite Tofino and Ukee with a sky train or a tunnel, and #4—build a youth center to hang out in with lots of activities. I was curious to see if a teenager, caught up with the tribulations of school, boyfriends gone bad, and home hassles had a sense of identification with the big picture, so I asked Jessica what her wish for the world would be. She didn’t miss a beat. “Equality—of race, of gender, of sexual preference, of opportunity, of everything.” Wise words from a 14 year old. It was a pleasure to interview Jessica, who curled up on my couch and spoke frankly. George Bernard Shaw said that youth was wasted on youth. Au contraire, in this case. Jeska, as she’s known to close friends, seems to be spending the energy of her youthfulness rather well. 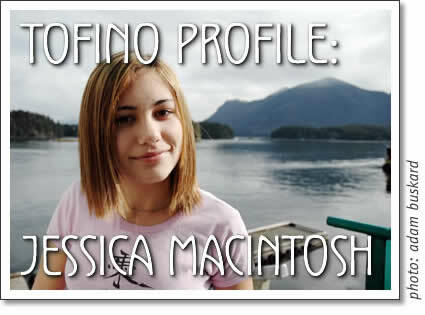 Tofino profile of Jessica Macintosh, written by Shirley Langer for Tofino Time Magazine in April 2005.